What makes a label fun and effective? What it boils down to for most people is the customization of the design. 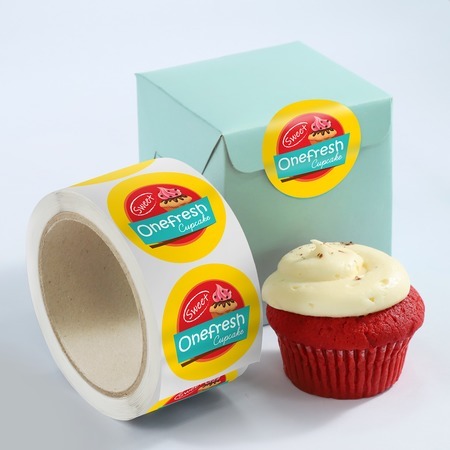 With custom label printing, you can create labels that will drive a positive impression and instant brand recognition. Labels easily promote your business as part of your product packaging, whether used for mailing as custom address labels or as custom wine labels. They also play an important role for event organizers that need to print personalized labels for weddings and other events. A shimmery finish perfect for indoor use. A smooth, satin-like finish that can be written on and perfect for labelling several products indoors. UV resistant coating that gives an extra gloss and can distinguish premium items in your store. A UV resistant option that’s also waterproof and can be used outdoors as well. Roll labels are the more practical choice for those who need to label products in bulk manually or using a dispenser. They’re easier to peel but also fit in most label dispensers for fast and easy application. You can adjust the label’s design according to our custom sizes and die-cutting options. Used on products that will be refrigerated and exposed to oil and water. Suitable for designs with a white or colored background. This sticker places the design on a transparent background that is oil resistant, waterproof, and suitable only for indoor use. This label has the smoothest finish and is normally placed on wine bottles that will be refrigerated and stored indoors. A slightly textured material with subtle horizontal and vertical lines on the sheet, normally seen on gourmet and specialty food products. Similar to the white laid texture material but with a cream color; recommended for indoor use and refrigeration. Only available for labels that have lengths larger than 1". Both cut-to-size and roll materials come in a matte, gloss, or high-gloss finish. Matte offers a rustic and organic look, while gloss and high-gloss surfaces let the colors pop. Both matte and gloss are applied on labels found on products displayed indoors. Using our online design tool is the first step to easy custom label printing. You can also upload a ready-made design. Try our free file check to make sure every detail is correct before printing. To help you get started, check out our visual guide on printing custom labels. Does printing time include the time needed to deliver my order? The printing time on the online calculator refers to the number of days to produce your order. You can estimate the transit time and expected arrival of your items by clicking on the “Estimate Shipping Cost and Delivery Date” link at the bottom of the calculator. What is the difference between white premium sticker paper, BOPP materials, and textured paper? White premium sticker paper is best used for items that will be displayed indoors but not refrigerated. Clear, white, and silver metallic BOPP uses a paper film that protects the label from oil, chemicals, and water. BOPP is also able to withstand refrigeration. Textured paper is often used on gourmet food and wine labels for its elegant and distinct textured finish. Should I use 70 lb. label paper or 4 mil. white vinyl sticker paper for my cut-to-size labels? White vinyl sticker paper is best for labels that will be used outdoors as this is UV resistant and can withstand other elements. The 70 lb. label material is suited for items to be displayed indoors. Choose from a gloss, high gloss, or matte finish, depending on your design. Matte and gloss are both writable while the UV resistant high gloss is not. What are the best uses for roll labels? For cut-to-size labels? If you need to label a large quantity of items, you can place the roll into a label dispenser for quick and easy application. Cut-to-size labels work better for promotional handouts. Working on your own custom label design can be a fun experience. But if you’re struggling with it, read our useful tips!